Elena Granatello joined De Berti Jacchia Franchini in 2017 and was previously partner at Mondini Rusconi. 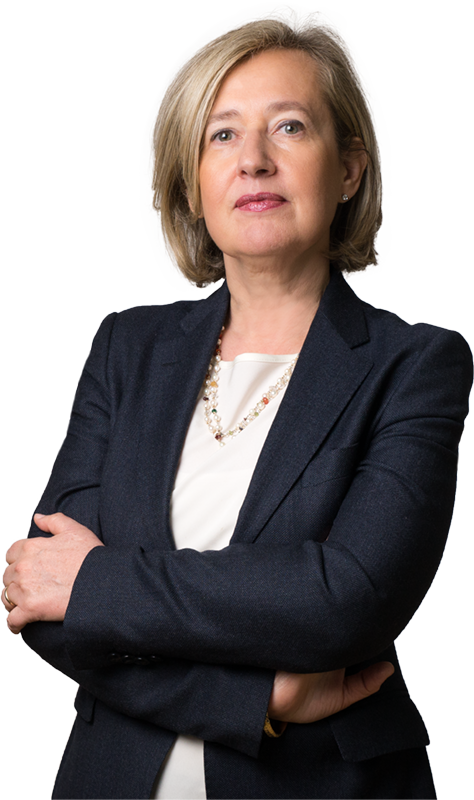 She qualified as avvocato in 1990, after a period of training, including internships at top law firms in Paris, and began working with the firm Bergmann Scamoni – which subsequently became CMS Adonnino Ascoli Cavasola Scamoni – becoming partner in 1994. Elena works in the field of civil and contract law, she is a litigator specialized in commercial litigation in all its phases, including enforcement procedures. Right from the beginning of her professional career, Elena has dedicated special attention to French and Belgian clients, both in the field of commercial litigation and in assisting Belgian and French companies with regards to their branches and subsidiaries in Italy. She assists clients principally carrying on business in the insurance and agricultural/food sectors. In general, she assists both Italian and foreign clients in contractual and non-contractual as well as insolvency matters. Advised and assisted a company leader in the production and distribution of oenological products in relation to the dispute with the General Manager and executive of the Italian branch who was dismissed/revoked for gross misconduct. Together with colleagues from the Employment and Labor team, assisted the Client in negotiating the agreement with the executive. Assisted a French leasing company operating in Italy, part of a leading banking group in France, in a complex credit restructuring operation related to a property leasing transaction, in collaboration with a pool of leasing operators of bank derivation. Assisted a French group operating in the digital media and entertainment sector in the liquidation of its Italian subsidiary, which also implied transfers of undertakings. After the liquidation of the subsidiary, assisted the French group in the credit recovery activities during the arrangement with the creditors. Assisted a French group operating in the food supplements sector in the acquisition of an Italian company already operating in the sector. Assisting the Italian subsidiary of the group for the follow-up of the corporate and contractual aspects. Assisting and advising a multinational company operating in the pharmaceutical sector in the follow-up of all the legal and contractual aspects of the relationships with its distributors in Italy, including pharmacies and wholesalers. Assisting a French insurance company operating in the credits and securities sector in all operations in Italy and in particular in the assessment of claims occurring in Italy.